Use the sunvisor to shield direct light through the front or side windows. To use the sunvisor, pull it downward. 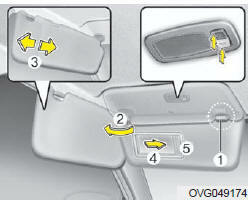 To use the sunvisor for the side window, pull it downward, unsnap it from the bracket (1) and swing it to the side (2). Adjust the sunvisor extension forward or backward (3). (if equipped) To use the vanity mirror, pull down the visor and slide the mirror cover (4). The ticket holder (5, if equipped) is provided for holding a tollgate ticket. If you use the vanity mirror lamp, turn off the lamp before return the sunvisor to its original position. It could result in battery discharge and possible sunvisor damage. For your safety, do not obstruct your vision when using the sunvisor.